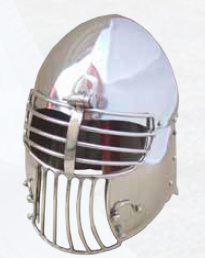 Bearded Sports Bascinet Helm is made for modern reenactment and combat; this was originally designed to be a medieval helmet, and this version was made for sword fighting, training and sport fencing; high crown of the helmet cap, the face is left almost completely open, protected by a heavy steel face-mask of horizontal and vertical steel bars, which is attached to a hinge at the helms brow and held secure by rotating hooks on the cheeks of the helm. Fits a 22 to 23 Inch Circumference. Offered in Either 16 Gauge or 14 Gauge Steel. The helmet also features an internal liner. The bascinet, both with and without a visor, was the most common helmet worn in Europe during most of the 14th century and the first half of the 15th century, including during the Hundred Years' War. This page was last modified on 1 November 2013, at 18:17.